The 2014/15 harvest started off with a bang. We began receiving our first coffees from lower elevation (HG) farms on September 29, 2014. On March 17, 2015, we received our last coffee cherry delivery, which came from Finca Santa Julia, a high elevation (SHG) farm. 5,167,540 pounds of coffee cherry passed through our wet and dry mill comprising 11 different varieties from 17 farms. In our QC Lab, a total of 591 first quality samples were analyzed in cherry, parchment and green, and finally cupped. We also cupped 188 yield samples, and 17 sub-product samples (because as we know, not all coffees are perfect. If it comes through our mill, we cup it. And sometimes that means we are cupping under-ripes, over-ripes and floaters, etc). We hosted 96 visitors from 34 roasting companies representing 14 countries. We set up 127 separate internal production cuppings, and 67 client cuppings. Throughout the harvest, we roasted 1,116 samples. Some days we received coffees from over 10 farms, all of which were analyzed and processed separately. On some nights, we didn't sleep. To keep energized, our full time mill staff of 24 consumed an estimated 1,348 pupusas. By the end of the harvest, 916,200 pounds of green coffee was packed into 6,108 jute bags and loaded into 31 containers, containing 96 individual lots and micro-lots. This harvest, we had the pleasure of working with 3 incredible baristas. Rubens Gardelli used a natural lot from Finca El Manzano and won 1st place at the 2015 Italian Brewer's Cup. Angelo Segoni, also from Italy, used coffee from Finca El Manazano and took 2nd place in the Italian Barista Competition. Charlotte Malaval, an independent barista from France, took 1st place in the French Barista Competition, and went on to place 6th at the World Barista Competition in Seattle using a Pulp Natural Yellow Bourbon from Finca El Naranjo. We feel honored to have supplied the coffee, as well as worked closely with these 3 amazing competitors. We look forward to supporting and collaborating with baristas during the upcoming competition season. 95% of our clients come to the farm every year to cup coffee, see processing, tour farms, select lots and learn about what is new since their last visit. What most people don't know, is that we also travel every year to visit our clients, see their roasting facilities, cup landed coffees and strengthen our relationship. During the months of June and July, our team visited 14 roasters across 6 U.S. states, and 8 countries. We traveled on 16 planes, 7 trains, 14 subways, 5 buses and countless car rides. It was a tiring and challenging few weeks for sure, but also incredibly fun and enlightening. We truly believe that our visits to client facilities are just as useful, informative and important as their visits to our farm and mill. We receive coffees from 17 farms, 2 of which are proprietary, El Manzano and Ayutepeque. Over the past 3 months, we have been very busy with renewal projects. At El Manzano, we cleared out 11 manzanas of adult red bourbon, to make room for new young varieties. In 6 different areas of the farm, we planted the following: 3,971 Pacas Injerto, 10,958 Caturra, 21,754 Pacas, 1,285 Pacamara and an experimental lot of 36 Typica Verde. Although we care for our plants as if they were human children, they don't always survive their first year out alone on the farm. So, we often have to replant failed individual plants the following year, and we call these "resiembras". This year 2,867 trees were re-planted consisting of the following varieties: Pacas, Caturra, Gesha, Pacas Injerto, and Orange Bourbon. We also purchased a third farm called San Gabriel, just down the road from Beneficio El Manzano. San Gabriel is situated at 1100 meters and is 17 manzanas. We will begin replanting this farm after the upcoming harvest, so stay tuned for updates! Today we introduce Finca Talnamica, the final farm from our partners the Ortiz Herrera brothers and sisters; who also own Fincas NataMaya, San Luis and San Jorge. Finca Talnamica sits on the edge of the Apaneca-Illamatepec mountain range, facing the Pacific Ocean. At 1,375 meters, the farm boasts a beautiful view of over one hundred kilometers of coastland. It is nestled directly in between the western towns of Apaneca and Ataco, in the department of Ahuachapan. This is our third harvest processing coffee from this farm, which was founded by the siblings' father, Alfredo Ortiz Mancia. Alfredo acquired a small piece of property in the area during the 1950's. Over the years, Finca Talnamica became Alfredo's passion, and he continued to purchase neighboring land, slowly increasing the total farm area. Today, the farm is just over 122 hectares. Nearly ninety percent is planted with Bourbon and Pacas varieties, and the remaining ten percent with the rust resistant Colombian Castillo variety. All coffee is grown under large shade trees, the majority of which are Ingas, and is further protected by a series of windbreaks, made up of Copalchi plants. Large Liquidambars, and Melaleauca trees, (believed to have been brought by Alfredo from Israel), line the perimeter of the property. Additionally, family members and farmers are cultivating a number of medicinal plants in their small gardens within the property. The farm is home to a waterhole and a small creek, that are protected with thick native vegetation. The siblings are very involved with the local community of Shucutitan, where the farm resides. Currently, they have a partnership with the NGO, Fundesyram, which teaches community members how to compost organic domestic residues and grow home vegetable gardens. Additionally, the family provides the salaries for two teachers at the local school, and has also assisted in the development of a women's micro-business. As we enter into our third harvest with Finca NataMaya, we are excited to continue our relationship with producing partners Nena and Hermann Mendez. Named after their two daughters, Natalia and Mayita, the Mendez’ purchased Finca NataMaya in 2005. The area, previously used for coffee cultivation, had been abandoned fifteen years prior. The farm is situated on Cerro del Aguila (Eagle Mountain) in the department of Sonsonate. Finca NataMaya is planted with 62 hectares of coffee varieties, the majority of which are Bourbon and Pacas, growing at an altitude of 1,270 meters and continuing until 1,600 meters. To protect trees from the harsh winds that occur in this region, the farm uses a system of both vertical and horizontal windbreaks called “cortinas” that serve to protect cherries during severe weather. This practice is illustrated in the photo below. In addition to coffee, there are 32 hectares of forest preserve with a variety of old growth Cypress, Oak and Cedar trees as well as many indigenous species. Half of this preserve is situated in a cloud forest, which ascends to the highest point of the farm at 2,035 meters. From Finca NataMaya, you can see a series of mountains within the Apaneca-Illamatepec range, as well as the nearby town of Juayúa. In May of 2014, the Mendez began to experiment with several microlot varieties, including Kenya and Pacamara, which they planted at 1,600 meters. Although Finca NataMaya is accessible by vehicle, it is quite remote. The local community of Ojo de Agua resides within the farm, whose members have inhabited this area for over 200 years. Due to its isolated location, the Mendez family has been passionate about collaborating closely and extensively with Ojo de Agua. Notable projects include a health clinic staffed with a physician, a primary school, a new soccer field for community members and students, a water tank, and latrines. 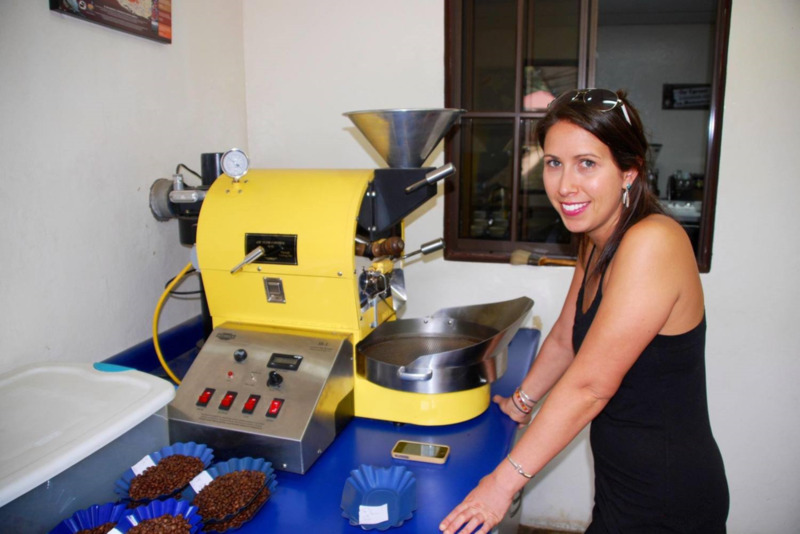 These programs were made possible by donations from the Mendez Family, the SQ Foundation, and U.S. roasting partners Caffe Ladro and Zoka Coffee. View a complete gallery of Finca NataMaya here: FINCA NATAMAYA GALLERY. We are proud to introduce our newest producing partner: Finca Argentina. Finca Argentina is a 35 hectare specialty coffee farm, situated on the northern slopes of the Apaneca-Illamatepec mountain range, in Turin, Ahuachapan. The farm has been producing coffee for over 70 years, and was purchased in 1967 by Luis Guillermo, grandfather of current manager, Alejandro Martinez. The farm is planted with nearly 100% Bourbon, and is managed by Alejandro Martinez, who is committed to maintaining and replanting areas of the farm that were affected by the recent outbreak of rust. Proactive management, has seen the farm make a near 100% recovery, and bordering areas of the farm, have been purchased and replanted with resistant varieties, in order to protect the central growing areas of Finca Argentina. The farm is divided into six micro-lots, (called tablones in spanish), that run from 1,150 - 1,350 meters above sea level. These lots (illustrated below), range in size, from three to twelve manzanas; and are planted with varying densities of trees. The smallest density lot contains 2,600 trees per manzana, and the heaviest contains roughly 3,500 trees per manzana. Positioned on the northern slopes on the Apaneca-Illamatepec Range, Finca Argentina faces the Guatemalan border, with a clear view of Volcan Chingo, which splits the El Salvador and Guatemalan border. Because of its location, the farm is less vulnerable to the heavy winds, common to this mountain range. It also receives an average yearly rainfall of 2,700 mm, several hundred more than the regional average. The average daily temperature is 23° Celsius. Some unique natural aspects of the farm, include a river, which runs from the top of the mountain, through natural geysers which heat the water, and leave it at warm temperatures as it flows through the farm. Mud geysers can also be spotted within the farm, boiling grey mud and generating steam. View a complete gallery of photos from our visit to the farm here: FINCA ARGENTINA GALLERY. Seven micro-lots of Finca Argentina. View of the Guatemalan border from Finca Argentina. Volcano Chingo in the center. Farm Manager - Alejandro Martinez, at one of the highest points of Finca Argentina.